The day was dry, but overcast with a strong wind from the sea to shore. We stayed put and walked over the dunes to Low Newton and The Ship Inn. It is a small village pub, nestled in the corner of white painted small houses. It is a small pub with bare stone walls and lots of warm dark wood. There are a few tables in side and even fewer tables outside on the pavement and on the green, but you can sit and eat on the green. They brew their own beers on site – Emblestones, Newton Stout, Shop Hop and Whitehorses – with Whitehorses the preferred tipple amongst our family. Or you can have a range of soft drinks from Fentimans etc. We ordered a range of different meals from the simple pub menu – toasties, tomato & basil soup. But the key for me is the local seafood or the cheese from Doddington Dairy near Wooler or local ham. The seafood includes local kippers (£5.95), kipper paté (£5.35) or fishcake (£7.95) from Swallow Fish in Seafoods, or hand picked crab from Newton Haven beach, collected by the husband of one of the ladies that works at the pub, so not just local food but mega-local food from the water outside. I had crab sandwiches (£6.75) and a crab & salad stottie (£8.75), both of which were delicious: fresh, rich and gently tasting of the sea. These simple treats were exquisite, showing that simple is best, made without adornment. For puddings, we ate apple crumble made on site. 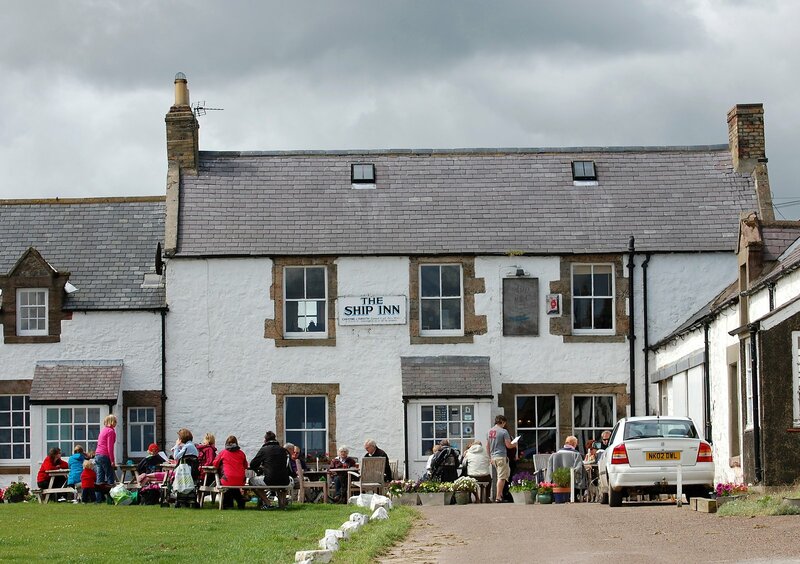 The key to the food at The Ship Inn is fresh, local food, made without flashy, unnecessary & poncy overchefing that you often get in “gastropubs”. I would walk for miles to find an oasis of what is brilliant about Northumberland, England and the world and this is one of those gems. This is a credit to the sea and I raise a cheer to Christine Forsyth – thank you. PS: you can eat an evening meal but you must book well in advance as you eat indoors and there is serious demand for the food. As a word of warning though – it is cash only, so no cards!